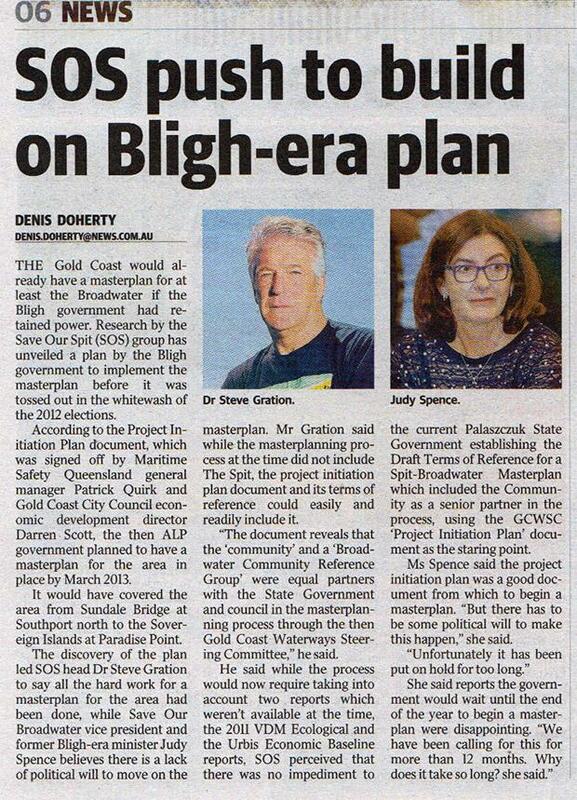 A legacy of the Anna Bligh era will make a community driven Spit and Broadwater Masterplan a significant step closer. "The scope enables the masterplan to consider its relationship with land uses between Seaworld Nara Resort and the Southport Yacht Club to ensure both water and land use planning for the Broadwater are complimentary." "The purpose of this document is to outline the governance and communications requirements to support the Broadwater Masterplanning project and ensure its success." "The masterplan must address and balance community, environmental and economic considerations before identifying implementation options and strategies." The "Southport Broadwater Parklands Q150 Project" and "Stage 2" work." Anna Bligh displayed the political will built on the legacy of others like Doug Jennings and the Gold Coast Community. The persistence and research of SOSA's Dr Steven Gration deserves a mention here. Steve has consistently maintained a research based approach balanced with incredible support/input from the community, journalists, government officers and politicians. Community groups including GECKO, Save Our Broadwater, Main Beach Association and other like minded groups are behind the establishment of Draft Terms of Reference for a State Government-led 'Broadwater-Spit Masterplan' beginning with an in-depth community consultation process. SOSA and other community groups appreciate the opportunities we have had to engage with GCWA, government officers and MPs. Community input is already in progress - it's time to seize the day and bring the plan to fruition! 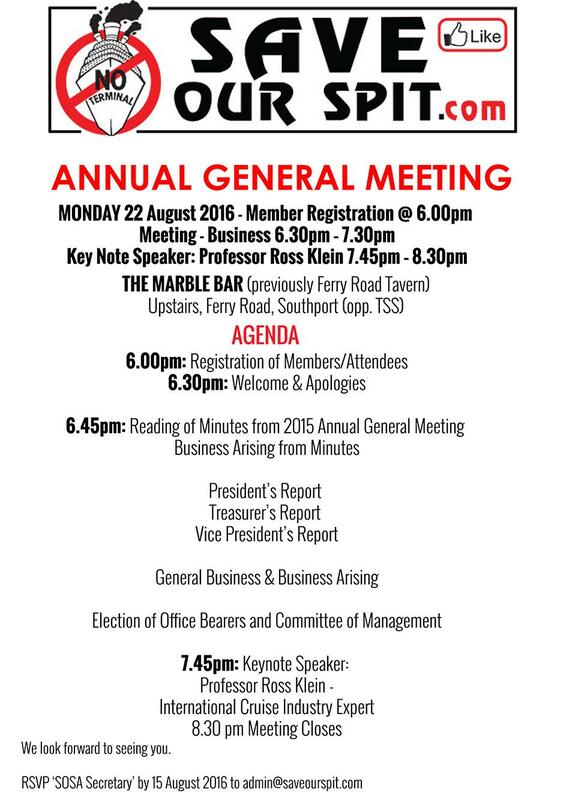 Please come to our AGM where key note speaker Professor Ross Klein will address us. "World's most respected International Cruise Ship Industry expert"
You do not need to be a member of SOSA to join in - everyone is welcome. Meet SOSA's Steve Gration, Luke Sorensen and others like Darren Crawford at our AGM. Thanks to those who have donated we can assure you donations are not going on 'self funded trips to China'. Please donate to help us continue our research.